A Planet Depos interview with brand-new court reporter, Kaylee Lachmann, RPR. Kaylee, can you tell us about your journey through court reporting school? After I graduated from college with a foreign language degree and realized it wasn’t doing much for me, I started working as a legal assistant. I was considering going to law school, but I wasn’t totally sure I wanted to be an attorney, so I started researching other careers in the legal field, and that’s when I stumbled upon court reporting. I was living in Oregon at the time, and there were no court reporting schools in my area, so I opted for the entirely online program through Clark State Community College. Going to school online was tough because I didn’t have a lot of other classmates to commiserate with, but in retrospect I think it really helped keep me focused. I wasn’t comparing my progress to anyone else, and I just kept my head down and worked as hard as I could. It took me a year and a half to get through school, and that was largely due to the fact that my then-boyfriend (now husband) helped support me, and I was able to quit my job about halfway through court reporting school so I could focus on gaining speed. We pinched pennies there for a while, but it was worth it! Court reporting school was by far the hardest thing I have ever done, and it is my proudest accomplishment. What were your job options or considerations once you completed the program? After I started court reporting school, we ended up moving to San Diego – which I was free to do, thanks to the online program. As I neared the end of court reporting school in the summer of 2018, I wanted to try my hand at the California CSR, but I was ineligible since I did not attend a California-approved court reporting school. They require students who did not attend California-approved schools to either be RPR-certified or have a year of experience as a working reporter – both of which I didn’t have. I scrambled to obtain the RPR in time for the November 2018 CSR, and I received it in October. However, it takes 4-6 weeks for the RPR certification to be officially processed, so I was still ineligible to take the November CSR exam. After working so hard to get through court reporting school as fast as possible, I was discouraged and felt bogged down by bureaucracy. I just wanted to start working already, so I started looking into other options, such as transcription and relocating to work out of state. That’s when I stumbled upon a great offer from Planet Depos to bring me out to Washington, D.C. to start working. Moving across the country was a big undertaking, but it has been a great first step for me. I am still planning to go back to California for the next CSR exam, and I have plans to eventually move back. It’s crazy to think that the first CSR exam I am eligible to take will take place about a year and half after I reached 200wpm in school! You passed your RPR before you began working! Very few reporters do. What do you feel was the secret to your success? I took each leg of the RPR a few times. When I took the first few, I would be sitting there, thinking that it sounded slow compared to my practice dictation, but my fingers would just freeze, I would stop breathing, and I would get dizzy. What helped me the most was getting into the habit of purposely breathing slowly and deeply when I was practicing and just focusing on the words flowing into my ears and out through my fingers. I also prepared for each test by getting used to dictation at way higher, insane-sounding speeds and just trying to get a stroke for every word. I am also a musician, and I have played piano and other instruments since I was very young, so that definitely helped me through my court reporting school and certification process. I already knew what it meant to spend hours upon hours in the practice room honing a skill, and I think that is probably the number one skill you need to build speed! You’ve had just a few weeks’ experience as a brand-new court reporter. Any surprises? Not really, but I have really been enjoying the variety of subject matter that I’ve had to cover so far. The variety was one of the things that drew me to court reporting, though, so it’s not too much of a surprise! Any advice for students nearing graduation? Court reporting school was tough and required maintaining a very high level of motivation every single day. What helped me was finding a practice routine and sticking to it no matter what, but taking breaks is also so important. I find that the quality of my practice sessions goes down if I don’t take breaks, so it’s better to just take a break in the first place and make the most of the time I do put in. Probably not fair, but where do you see yourself in five years? Hopefully still freelancing, and maybe even traveling for a few international depos! After completing her undergraduate degree at the University of Oregon, Kaylee Lachmann decided to attend court reporting school online through Clark State Community College in Ohio. 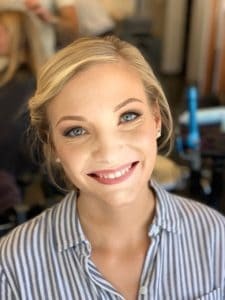 Kaylee recently obtained her RPR certification and launched her court reporting career in Washington, D.C., where she lives with her husband, Kyle, and cat, Phoebe.